The Worst Witch tickets available for the Vaudeville transfer! Some of our favourite books which have been adapted for the screen numerous times, The Worst Witch makes its West End transfer to the Vaudeville Theatre following an extremely successful UK tour. The Worst Witch tickets are sure to be among the most sought after of the Vaudeville's season so make sure you secure your place to see everyone's favourite worst witch, Mildred Hubble on the London stage. Before Harry Potter exploded on the scene there was another seemingly ordinary child who wound up in the most extraordinary of places. A school for witches. Mildred Hubble and her earnest, though bumbling magical adventures have been childhood favourites for years. Now watch as Mildred and her friends (and rivals) enter their final year at school and embark on their biggest and most important adventure to date. Written by Emma Reeves and directed by Theresa Heskins, this new adaptation features all of Jill Murphy's original characters. You'll see envious, stuck-up Ethel Hallow who is always out to ruin Mildred's fun and get her into a spot of trouble if possible. Miss Hardbroom returns with her no-nonsense attitude and strict style of teaching. And our dear, clumsy but good-hearted Mildred is right in the middle of some mayhem that's sure to put them both into a tizzy when an old enemy returns with an evil plan for revenge that doesn't just put the academy at risk but could threaten the whole world. This new adaptation features original songs and music with magic aplenty and large helping of Mildred's unique brand of total chaos. The show was designed by Simon Daw (Humble Boy) and has music by Luke Potter (Hetty Feather). Aerial consultancy is by Vicki Amedume with choreography from Beverley Norris-Edmunds choreographs, and illusions by John Bulleid. Lighting and sound design are by Aideen Malone and Leigh Davies, respectively and puppetry direction and design is by Paschale Straiton. 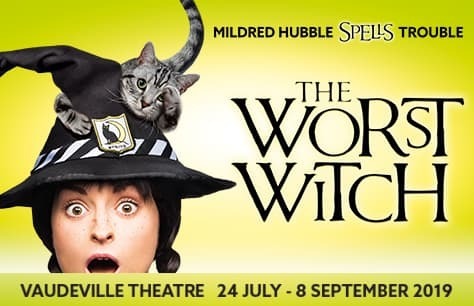 While information about the cast for the West End transfer of The Worst Witch has yet to be announced, the UK tour featured Danielle Bird (The Hypocrite) as Mildred Hubble. The roles of Agatha and Miss Cackle were played by Polly Lister (The Snow Queen) with Rachel Heaton (Passing) as Miss Hardbroom, Rebecca Killick (Pink Mist) as Maud, Rosie Abraham (Peter Pan Goes Wrong) as Ethel and Anna Crichlow (Common) as Enid. The cast was completed by Molly-Grace Cutler as Miss Bat/musician, Megan Leigh Mason as Miss Drill/musician, Emma Lau as Drusilla and Meg Forgan as Fenella/musician. Additional information about the casting of the Vaudeville Theatre transfer of The Worst Witch will be available in due course. Jill Murphy's The Worst Witch series consists of eight books which were published between 1974 and 2018. The series has sold more than 4 million copies and spawned a television film along with multiple series and spin-offs. In 1986 a television film was made starring Fairuza Balk as Mildred joined by Tim Curry as The Grand Wizard and Diana Rigg as Miss Hardbroom. There have since been several tv series and spin-offs based on the characters and stories including a Netflix coproduction. The Netflix series, which stars Bella Ramsey, premiered in 2017 and entered its third series this year. Tickets to The Worst Witch are sure to disappear quickly. Don't miss out on the magic. Be sure to Book The Worst Witch tickets now to guarantee your place at the academy!